So, our nephew Ryan has been staying with us while his new apartment is getting ready for him. You may have heard me mention Ryan before, he was the mastermind behind this delicious Tropical Fruit Salsa we served over grilled salmon last summer. 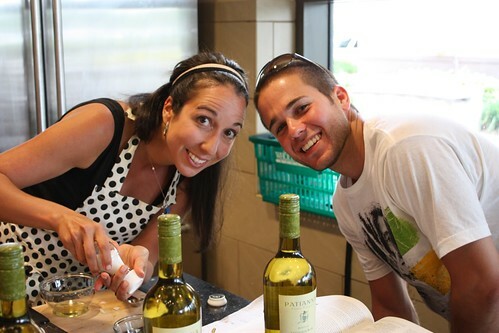 What’s fun about Ryan staying with us is that he likes to cook so it definitely adds to the creativity going on in the kitchen. Saute pepper, mushrooms, onions and garlic and let cool. Combine basil, egg, Parmesan cheese and wine in a bowl. Add cooked vegetables and ground pork to bowl and gently combine. Form into patties. Place on broiler pan and cook for about 15 minutes. 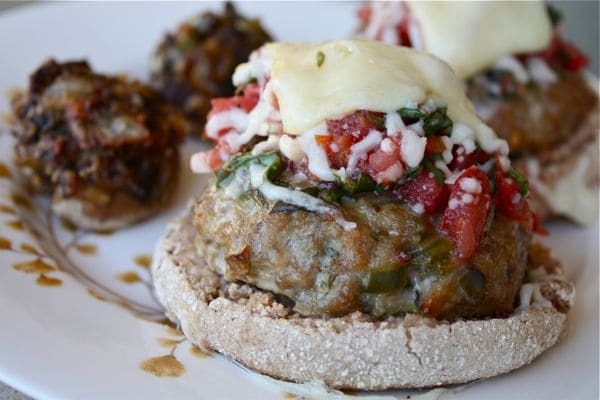 Take cooked patties out of oven and top each one with a spoonful of bruschetta, Parmesan and cheese. Turn broiler on and place burgers back into oven. Cook until cheese is completely melted and slightly browned. Serve open-faced style on toasted English Muffin. It really does sound delicious Aggie. I am quite sure I need to try this. These lok so good! I love melts – especially when they involve english muffins! And of course anything with wine is a plus!! What a great idea! These look fantastic! love this idea–think I could sub turkey for the pork and it’d still be delish?? those look fantastic! a great healthy way to grill! This looks amazing. Plus who does not like bruschetta (sp?) and burgers… this is definately a summer must. Those look fantastic! What a great way to work with what you already have on hand! This looks definitely irresistible! Want to have a bite from it, drooling! I’m just so addicted to bruschetta lately. It looks awesome prepared this way! I love creativity in the kitchen, what a great way to use up fantastic ingredients. 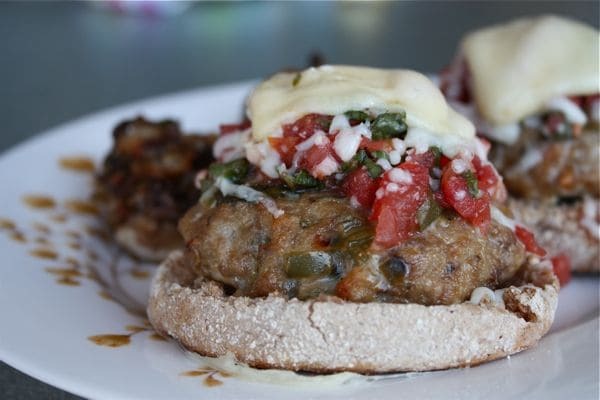 Some of my favorite flavors….bruschetta, cheese, burgers. 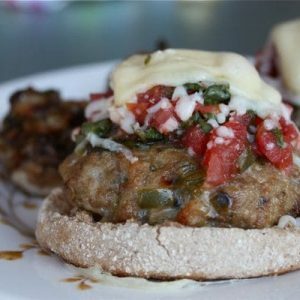 I love to use english muffins as rolls for burgers too! 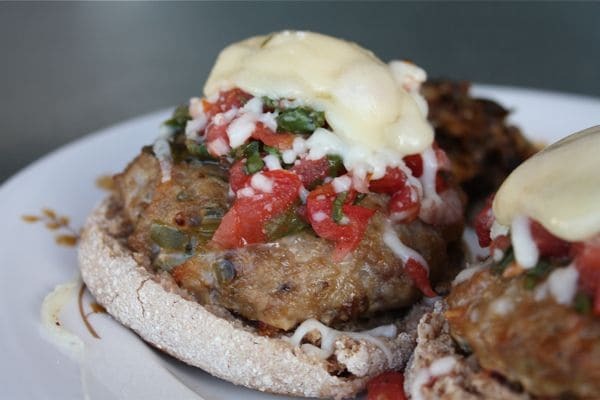 Those bruschetta patties look so good all covered in melted cheese! This looks incredible! Right up my alley. It’s a perfect way to use up all of my fresh summer tomatoes.